Hot Water on Demand | Butler Plumbing Heating & Gasfitting Ltd. Storage or Tankless? What is the difference? Tankless hot water heater are just that – tankless. No water storage tank at all. With a tankless system, the water is pushed through a heat exchanger, quickly heating the water to a predetermined temperature. Once appropriately heated, the hot water is sent through to the faucet. When you turn the faucet off, the heat exchanger is turned off. This process is virtually instantaneous, hence the term “hot water on demand”. Tankless hot water heaters provide an endless supply of hot water for as long as it is needed. This means that the endless struggle of who gets to shower first is over! 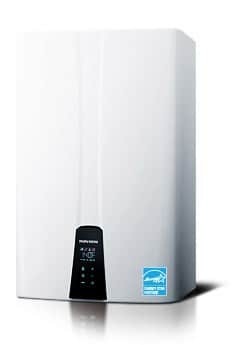 With a tankless water heater you will not only save time but also save money on your energy bills. 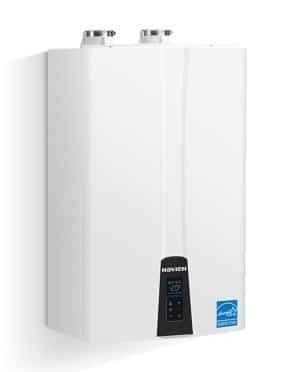 A tankless hot water heater heats water only when you need it which allows you to save on utility bills. In addition, the absence of a tank means this unit is great for smaller spaces. Gas powered tankless water heaters have the capacity to heat water for entire houses. If you are thinking about installing a tankless water heater, but are unsure which option would be the right fit for your home, just ask us! 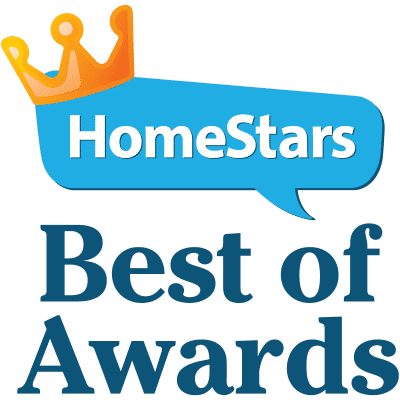 We’d love to set up an in-home estimate to find your perfect hot water heating solution. Every house and building requires different tankless hot water heater installation methods. As hot water plumbing professionals, we pay special attention when making connections to water, gas and venting. We know what a properly running hot water heater looks and sounds like. We have many years of experience in water heater repairs and installations and will make sure that the entire process is seamless from start to finish. Tankless water heaters offer flexible installation options. Due to the smaller size of tankless units, we are able to install them in non-traditional spaces such as crawl spaces and closets. The space saving factor makes tankless water heaters perfect for use in any size home – especially for modular and manufactured homes. We carefully handle and install your new tankless hot water heater and remove and dispose of your old tank. You will enjoy years of trouble free hot water with your new energy efficient, tankless hot water heater. One of the best tankless water heater features is its durability. Tankless hot water units can last up to 20 years before needing to be replaced – that is double the life expectancy of a standard storage tank! Even with the longer life expectancy, it is still important to maintain your unit. Annual water heater maintenance and inspections can significantly increase the life of your heater and maintain optimal efficiency. Annual maintenance is also great for catching issues before they become problems and impact your home. With over 30 years of experience in the heating and plumbing industry, Butler Plumbing can help you save money and time with a tankless water heater installation. We will assist you in finding the best solution for your home or business. We provide estimates for larger jobs, and will talk you through the process before we begin work. At Butler Plumbing, providing our customers with reliable, honest and high quality service is our mission. Our high quality service stems from our commitment to each and every customer combined with our wealth of experience in the industry. Butler Plumbing is your trusted source for all of your tankless water heater installation requirements. Each of our technicians is as skilled water heater installer and well versed in the latest technologies and techniques.